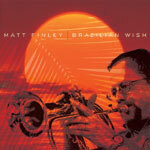 A professional musician for fifty years, Matt Finley plays flugelhorn, trumpet, flute and soprano sax. A native of Lake George, he graduated from Union College, where he led the Union Jazz Workshop to a semi-final appearance at the American College Jazz Festival. He earned his master's in education from the College of Saint Rose. Matt performed for many years with Grammy-winning baritone saxophonist Nick Brignola and was a featured trumpet soloist and arranger with the Albany Jazz Workshop. Matt studied composition with Edgar Curtis, Director of the Albany Symphony Orchestra. Matt leads Rio JAZZ, a Brazilian jazz concert band formed in 1988 featuring Peter Tomlinson, Jeff Ciampa, Don Miller, Joel Rosenblatt, Tomas Martin Lopez and others. Matt is also musical director for his wife, singer/songwriter Denise Jordan Finley. They live in New York's Mid-Hudson Valley and in Lake George. Matt is a retired professor of computer information systems and was academic dean at Dutchess Community College in Poughkeepsie, New York. Matt's 2006 CD, "Brazilian Wish", features nine of Matt's original Brazilian jazz compositions of sambas and bossa novas played by an all-star lineup produced by Jon Werking. Musicians include Romero Lubambo [Trio da Paz], Warren Bernhardt [Steely Dan & Steps Ahead], Mark Egan [Pat Metheny, Sting & Larry Coryell], Joel Rosenblatt [Spyro Gyra], Jon Werking [New York Voices], Tomas Martin Lopez [NYC Latin bands], Dave Finck [everybody's Brazilian CD], Jeff Siegel [Sir Roland Hanna], Jeff Ciampa [Dave Matthews], and horn section Dan Levine, Barry Danelian and David Mann [Tower of Power].